94% of customers give this Bissell carpet cleaner a 4- to 5-star rating. This top-rated carpet cleaner really does make a visible difference. It has a large tank capacity, so you won’t need to stop to empty and refill as often. It’s really bulky, but the handle does fold down for storage. It's heavy for those who have to carry it up stairs (40.6 pounds) and tough to maneuver when it’s turned off. If you want a tried and true carpet cleaner, this 4-star Hoover has more than 11k reviews on Amazon alone. It’s easy to assemble, lighter than most carpet cleaners (19 pounds), and includes multiple attachments for whole-house cleaning. Most complaints from customers are about the water tank leaking or being too small. It’s affordable and a great size for apartments and small houses. Customers love how well it works on spills and pet stains. It doesn’t have an attachment for upholstery or stairs and the tank is on the smaller side. A hardworking carpet cleaner that really deep cleans floors. Powerful suction with standout Dual Cross Action Brushes. Customers reported having to stop, empty, clean, and refill more often. The Shark Sonic Duo is better for hard floors than carpet, but pet owners swear by it. It’s the only machine on our list designed for hard floors. It’s also the easiest to maneuver with 180-degree swivel steering. It’s won’t deep clean carpet and it doesn’t have suction, but customers have reported positive feedback about surface stain removal. If your carpet is looking dull, worn, or stained, it’s time to deep clean. You can rent a carpet cleaner, but rental fees add up and you’ll be limited to cleaning the whole house in just a day or two. Purchasing your own will save you money and allow you to act quickly on new stains or take your time when you’re ready for a full-house sweep. To save you even more time, we found the best carpet cleaners for deep cleaning, pet stains, and even hard floors. If this is your first time shampooing the carpets, read on for some carpet cleaning tips and stain removal tricks. In addition to vacuuming once or twice a week, professionals suggest homeowners should shampoo their carpet with a carpet cleaner two to four times a year. The frequency will depend on how many children, pets, and foot traffic you have. Renting a carpet cleaner may seem economical at first if you’re only shampooing your carpet every six months. But Bissell or Rug Doctor carpet cleaner rentals cost $30 for 24 hours or $40 for 48 hours. After four rentals, you could have bought the popular Hoover carpet cleaner. You’re not only spending money, but you’ll also be cleaning on a time crunch. You’ll have to work quickly to remove furniture from each room and clean the whole house within 24 to 48 hours. We’re all about making smart investments at House Method. That’s why we recommend saving your money on a limited-time rental and investing in your own carpet shampooer. After reading thousands of carpet cleaner reviews and researching the cleaning process, we’ve found that buying a carpet cleaner is money and time well-spent. Carpet cleaners have tanks that hold water and cleaning solution. The machine sprays sudsy water while a brush scrubs to loosen debris and dirt from carpet fibers or crevices of hard floors. Some carpet cleaning machines have a heating element that cleans carpet with warm instead of cold water. Although hot water extraction dissolves more dirt and expedites the process, cold water is safer to use on certain flooring types. If your machine doesn’t have a heating element, you can still fill the tank with hot water. It’s also important to note that some carpet shampooers do not have suction, which means you’ll have to double-back over the carpet with a vacuum cleaner to actually remove the dirt that the carpet cleaner loosened. You can tell from the size of this sucker that it’s a heavy-duty carpet cleaner. 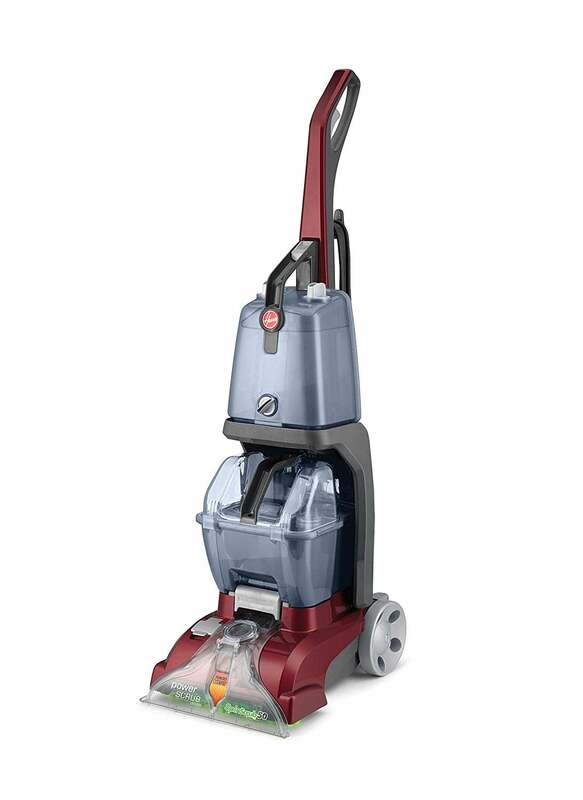 Bissell is a popular brand name in the floor care vertical thanks to its exceptional picker-upper performance. If you rent a machine, you’ll likely have a Bissell carpet cleaner to choose from. This professional grade carpet shampooer is great for larger homes and uninterrupted cleaning since it has a high-capacity tank that you don’t have to empty as often as other machines. It includes three bottles of cleaning solution and an attachment for cleaning upholstery, stairs, and those hard-to-reach spaces between baseboards and carpet. For carpet cleaners, size usually indicates performance level. 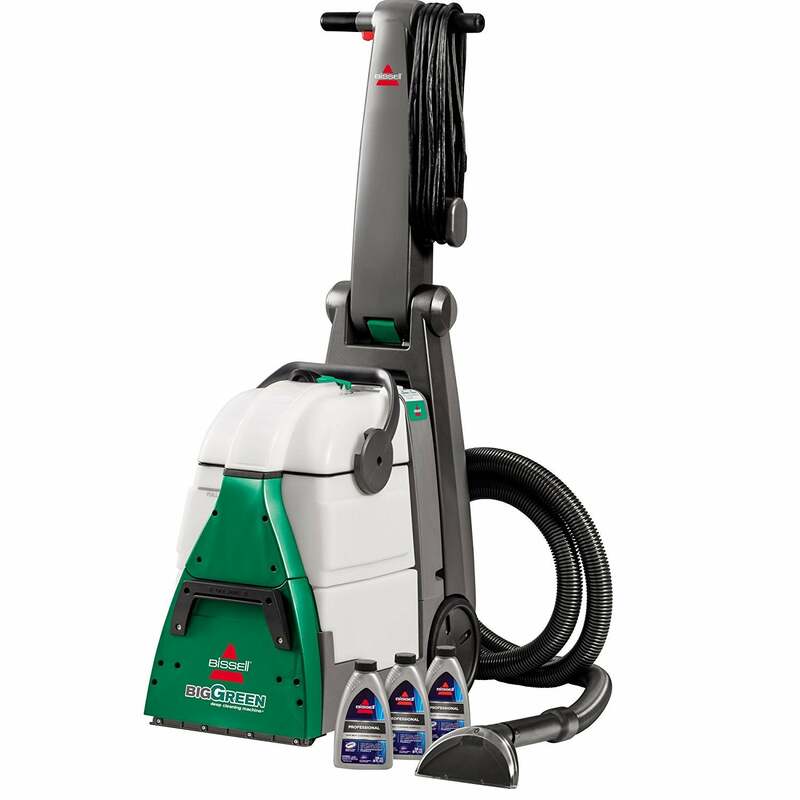 True to its name, the Big Green Bissell is really big, but it’s also the best carpet cleaner on the market. If you’ll have to carry your machine up and down stairs, you’ll want to pay attention to its weight. The carpet cleaners we reviewed range from 19 to 40.6 pounds without water. If you need to cover larger spaces, look at the width of the cleaning path. Carpet cleaners tend to be bulky, but there are a few models that are easier to maneuver, like the Shark Sonic Duo. However, you might compromise power for portability. Tanks size was the most common complaint we came across while reading carpet cleaner reviews. Like most chores, carpet cleaning is not fun and it can be frustrating to have to stop several times to empty, clean, and refill the water tank. For quicker cleanup, you’ll want a carpet cleaner with high-capacity dual tanks. We mentioned this above, but we think it’s an important point to reiterate. Not all carpet cleaners have suction power. This means you’ll have to go back over the shampooed carpet with a vacuum cleaner to remove the dirt. The Shark Sonic Duo is an example of a carpet cleaner without suction. If you have mostly hard floors in your home, this might be a better choice for you. There are two types of brushes: motorized and fixed. Motorized brushes rotate to really scrub the shampoo into the carpet and loosen embedded dirt and debris. If you’re looking for a powerful brush, we suggest the Rug Doctor carpet cleaner. Carpet cleaners with fixed brushes won’t clean as deeply, but they’re usually more affordable. Note: The Shark Sonic Duo has a padded surface rather than a brush so it won’t scratch wood floors. Many carpet cleaners will include a hose attachment for cleaning stairs and upholstery. Check the length of the hose to make sure you can clean as you climb stairs while the machine remains at the bottom level. The carpet cleaners we reviewed have seven- to nine-foot hoses. You’ll get more for your money by buying the Hoover carpet cleaner. In addition to an eight-foot hose attachment, it comes with multiple tools designed specifically for spot cleaning, stairs, upholstery, and crevices. It’s lighter on the budget and the body, as it’s only 19 pounds (compared to the 40-pound Bissell). With a built-in heating unit, motorized brush, and suction, the Hoover checks all of the boxes at a fair price. Use the carpet cleaner every three to six months. Hire a professional carpet cleaning service once a year. Use doormats and rugs to reduce the amount of dirt tracked onto the carpet. For a really thorough clean, vacuum before and after you shampoo carpet. Pretreat soiled areas with diluted detergent. Let it sit for 10 to 15 minutes. Move furniture and don’t replace it until the carpet has dried, which can take anywhere from six to 24 hours. If your carpet cleaner doesn’t have suction power, don’t forget to vacuum afterward. If you can, wait for warmer weather to shampoo carpets so you can open windows, turn on fans, dehumidifiers, and the AC to speed up the drying process. Treat stains immediately. See the table below for some of the best carpet cleaning solutions. Which is the best carpet cleaner to buy? Our vote for best carpet cleaner is the Bissell Big Green Professional Grade Carpet Cleaner. It has dual, high-capacity tanks, so you don’t have to stop halfway through cleaning to empty, clean, and refill the carpet cleaner. 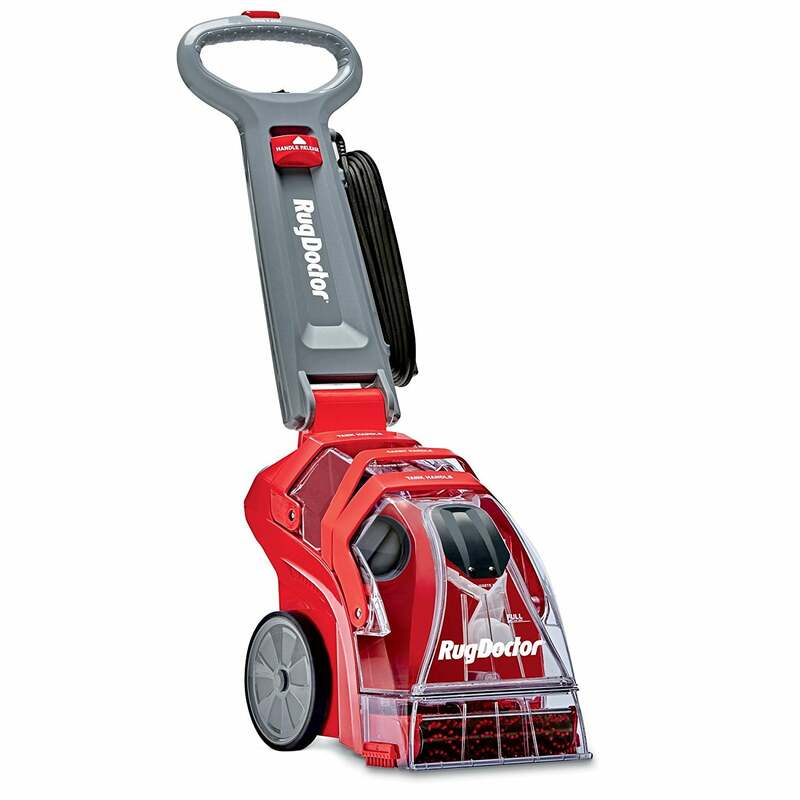 It has a large, motorized brush to scrub loosen dirt and free up fibers. Powerful suction removes debris and leaves carpet clean. You’ll see a noticeable difference after you use the Bissell. The Hoover carpet cleaner is a close second to the Bissell. It’s a portable carpet cleaner with multiple attachments are included so you can clean every nook and cranny. The Bissell PowerLifter PowerBrush Upright Deep Cleaner might be the best carpet cleaner for pets. Bissell also sells a pet stain cleaning formula you could try for stubborn stains. If you have mostly hard floors, like wood and tile, the Shark Sonic Duo Carpet and Hard Floor Cleaner is a better option for you. It has a smooth cleaning pad that won’t scratch those hardwood floors that you’re so proud of. How often should you shampoo carpet? Homeowners should shampoo carpet every three to six months. Parents and pet owners should expect to deep clean carpets more often. The carpet cleaners we reviewed came with their own, brand name cleaning solutions. When it’s time to restock carpet shampoo, refer to your owner’s manual to find out whether your carpet cleaner can take other cleaning solutions, like diluted vinegar. Some of the best carpet cleaning solutions are made with household items. These can be just as efficient and made with less chemicals than store-bought cleaning formulas. Some solutions include diluted vinegar, baking soda, diluted dish detergent, hydrogen peroxide, club soda, and shaving cream. Apply one of these household solutions as soon as you spot a stain. Allow the solution to sit for a few minutes before you blot, scrub, or vacuum the stain. What kind of carpet cleaning is the best? Dry carpet cleaning is the application of cleaning or household solutions (spray foam, vinegar, club soda, starch) to stains, scrub or blot by hand, and then vacuum the residue. Hot water extraction uses a carpet steam cleaner to kill mold and bacteria with heat, but you can expect longer drying times between 12 and 24 hours. Carpet shampooing is when you use a carpet cleaner, like the ones we reviewed above, to deep clean carpet with shampoo, a brush, and usually some kind of suction. How do you clean carpet yourself? Professionals in the housekeeping industry recommend vacuuming at least once, if not twice a week. You should treat stains immediately with dry carpet cleaning methods—whether store-bought or homemade solutions. You should shampoo carpet with a carpet cleaner every three to six months. You can rent a carpet cleaning machine for $30 to $40 or invest in your own. We’ve featured the five best carpet cleaners above. Hiring a professional carpet cleaner once a year is also recommended. What's the best Bissell carpet cleaner? We've tested and researched the top Bissell carpet cleaners on the market to provide you with information that will help guide your purchase. If you rent a carpet cleaner, you'll likely get a Hoover. You can save money in the long run by investing in your own carpet cleaner. Hoover carpet cleaners are backed by commercial-grade power and quick-dry technology. Need more reasons to buy? Read our review of 5 Hoovers here.